IT’S A BIT LIKE THE ELEPHANT in the room. Do I write about it or not? To avoid the topic seems akin to closing my eyes and pretending I don’t see that which exists. “It” would be the terrorist threat against the Mall of America. I live 45 minutes from the mall, which the Somali terror group al-Shabab specifically names as a possible target for attack in a video released this past weekend. Tucked away in the north land, most Minnesotans likely have felt secure here, far removed from such terrorist threats. But I’ve always thought this mega shopping center in Bloomington could be a target for attack by terror groups or individual extremists. Consider the name, Mall of America. “Mall” represents commerce and trade and, probably in the eyes of those who dislike Americans, consumer greed. And the “America” part of the mall’s name, well, that’s a bonus. Precisely the place these terrorists hate. The Mall of America draws some 40 million visitors annually. With its 520 plus stores, 50 restaurants, LEGO play area, aquarium, theme park, movie theaters and more, the complex is one of the world’s top tourist destinations, according to the MOA website. Perfect target. I’ve never been to the mall. I simply have no desire to visit. So, for me personally, I don’t need to consider whether I would feel safe going there now. But for those planning a trip here, this threat certainly must weigh on minds, consciously or subconsciously. Northfield Middle School recently canceled an eighth grade band trip to the mall. 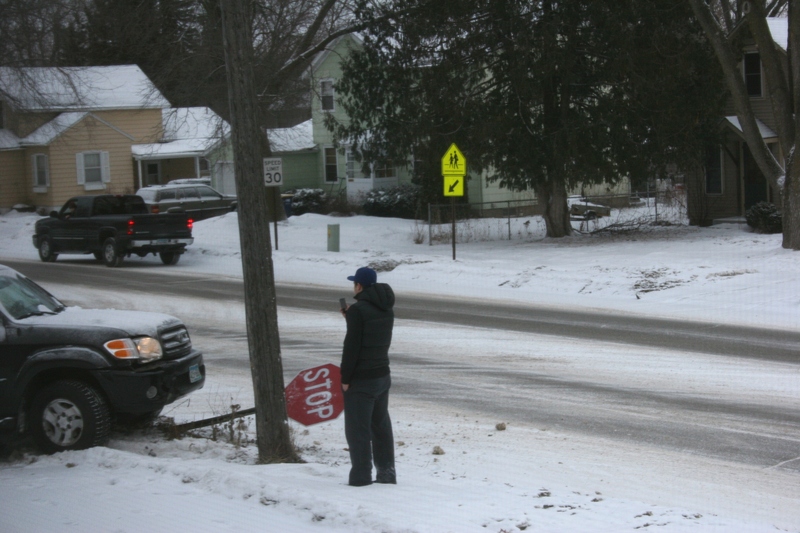 The Orono Middle School likewise canceled a physics class visit. How about you? If you had a daughter or granddaughter who is crazy about the American Girl doll, would you now take her to the MOA American Girl store? Would you celebrate a child’s birthday at Nickelodeon Universe®? Would you tour SEA LIFE® Minnesota Aquarium? Would you see “American Sniper” in a mall theater? A friend’s daughter works at MOA. You can bet both mom and daughter now carry a level of concern. Who wouldn’t? This photo shows the ever-growing diversity in my community as seen in this gathering after Faribault High School’s 2012 commencement. Minnesota Prairie Roots file photo. And I have to wonder about Minnesota’s Somali population. Do they now feel like they are under scrutiny? 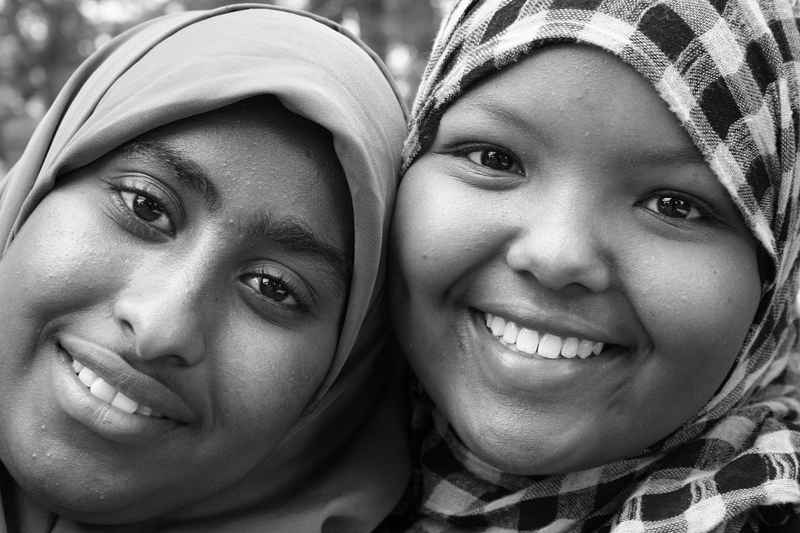 My own community of Faribault has a significant Somali population. Even before this threat, tension has existed here between some long-time locals and these newest immigrants. I hope this current situation does not heighten tensions. I have to trust that Minnesota Nice will prevail. Al-Shabab has also successfully recruited young Somali men in Minnesota to join its cause. That’s already been a major cause for concern among officials and those in the state’s Somali population. I have to believe that most Minnesotans will stand sensibly strong and watchful in the face of this latest threat. Yes, go ahead and laugh. Can you see the similarities between Sponge Bob and the Minions? OK, maybe not so much. But to the untrained don’t have kids at home or grandkids yet, the two different cartoon characters do kind of resemble one another. 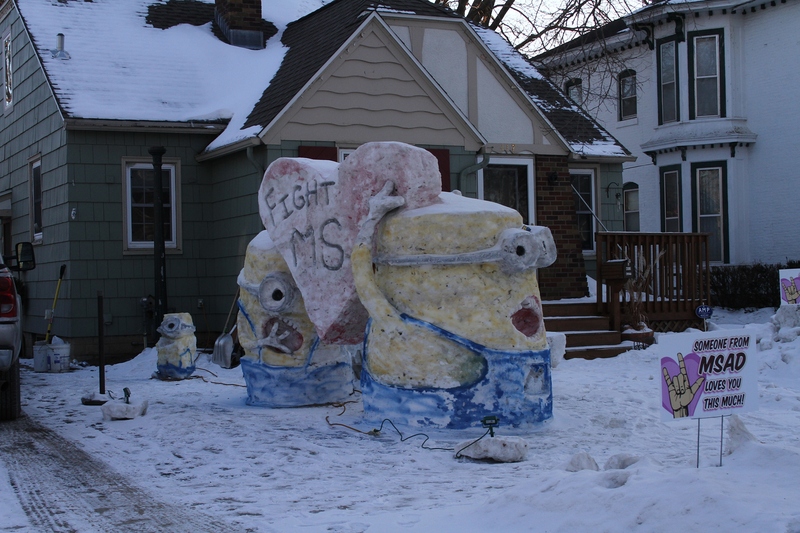 Kurt Klett recently sculpted these Minions from the Universal Pictures 3-D movie “Despicable Me” in his Faribault front yard. This marks the sixth year he’s created a snow sculpture. Soon he’ll change the heart to a shamrock in celebration of St. Patrick’s Day. The “Fight MS” message is Klett’s personal campaign to raise awareness about Multiple Sclerosis. He has the disease. You have to admire a guy who, each year, crafts snow sculptures, especially in a winter like this with minimal snow and plenty of frigid temps. 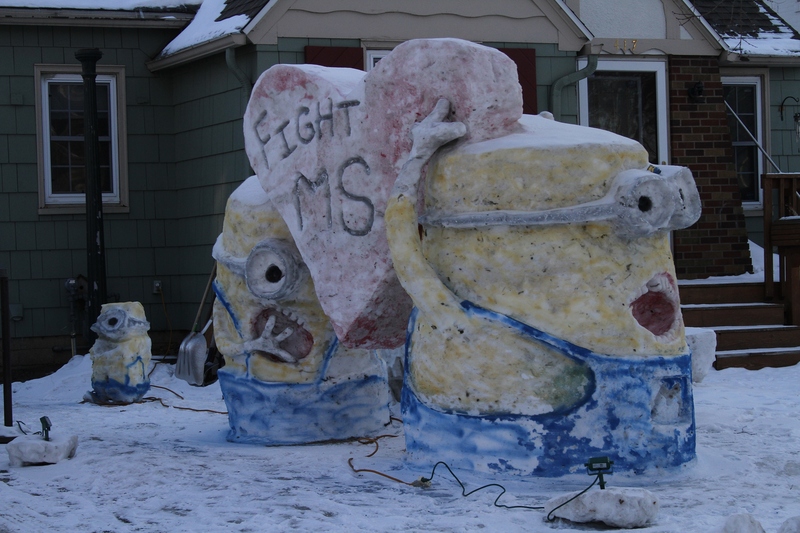 His artwork brings a bit of fun to a long, cold Minnesota winter. 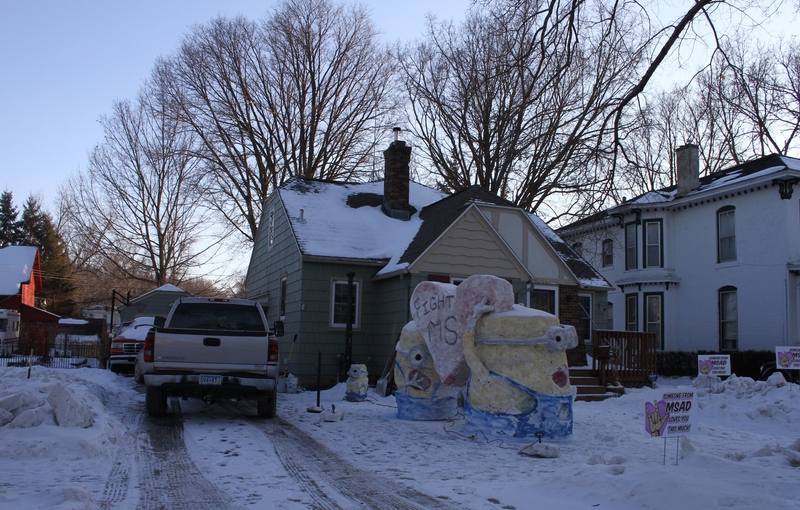 FYI: Click here to read about the snow sculptures Klett created in 2014 in his yard at 417 Second Street Northwest. MY CANON EOS 20D died on Sunday. My old Canon 20D camera, with a battery grip. I should have seen this coming, should have been shopping for a different camera. But when you’re in denial, it’s easy to cross your fingers, utter a prayer, hope against hope that everything will be alright and the error message won’t flash again or the camera won’t lock. Again. But all the hope in the world could not save my Canon DSLR from the graveyard. My new camera, minus a battery grip, which would have cost me an additional $200. Batteries are $80. I did not get a new lens, although I really wanted one. 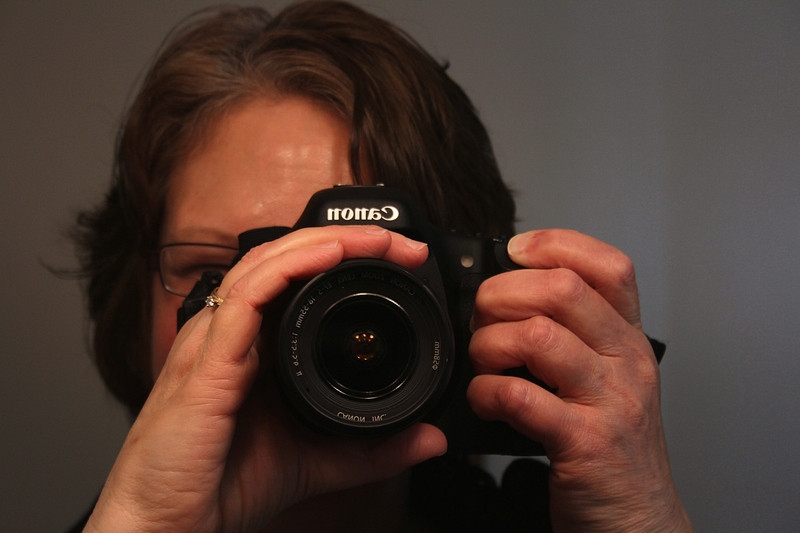 I’ve replaced it with a used Canon EOS 7D. I’m not convinced yet that I will keep the replacement as it requires more camera knowledge than I possess. It’s rather like returning to my film 35 mm SLR camera, relearning the basics of shutter speed and f-stops and ISOs. Then toss in white balance and a whole lot of other settings and I’m overwhelmed. Yes, I got lazy with my 20D and relied on the cheat icons for landscapes, portraits, action and such. I never bothered to learn the manual operations. But it worked. I was shooting award-winning photos, images that sold to various sources, photos that I liked. 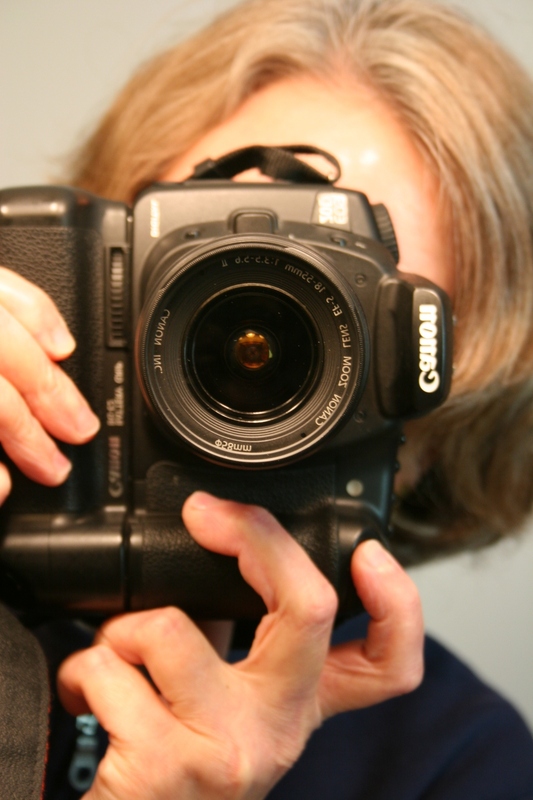 The camera was a dependable workhorse during my many years working for a magazine. Now I’m back at square one. And I don’t like it. I feel unsettled. I don’t like change. Plus, as my husband will tell you, I find it difficult to spend this much money on a camera, even if I need it for work. I am not good at spending money on myself. Adding to the challenge is the lack of an English language manual. Yes, I can go online and find a manual. But gosh, darn it, when I pay this much for a camera, even if it is used, it should come with a manual printed in a language I can read. I can take free classes at the place where I purchased my camera. That is a plus. And the saleswoman who sold me the EOS 7D was extremely patient and helpful in instructing me in the basics. Extremely patient. That’s why, when I returned an hour after I left, she probably wanted to hide in the back room. But, while shooting in the community of Elko on the way home, I noticed a diagonal line across every single frame. Back to the camera store my husband and I zoomed. Turns out a strand of hair was caught inside the camera. Should I keep my new used camera? Do I just need to give it time and practice? I have 29 days to change my mind. I have another option. A friend has a Canon 20D, just like my old one. He’s offered to let me try it out. Plus he’s got a cool lens that may interest me. He promises to sell the camera at a better price than anywhere else. Hmmmm. You can’t miss this bright yellow house along a Redwood County road just off U.S. Highway 14 in Lamberton. 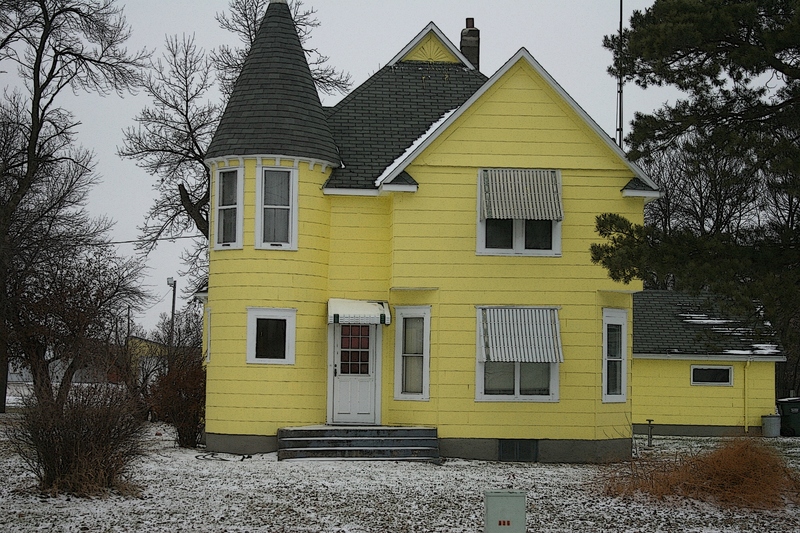 WHEN I SEE A HOUSE painted a jolting hue like this bright yellow house in Lamberton, I have questions. Is this the homeowner’s favorite color? How have people reacted to this color choice? What do you think of houses painted in unexpected, bold colors? Have you ever chosen an unconventional traffic-stopping color for your home? Let’s hear. THE THUNK JARS my focus from the computer screen to office window. Through the pane, I notice an overhead wire swaying. My first view of the crash through my living room window. 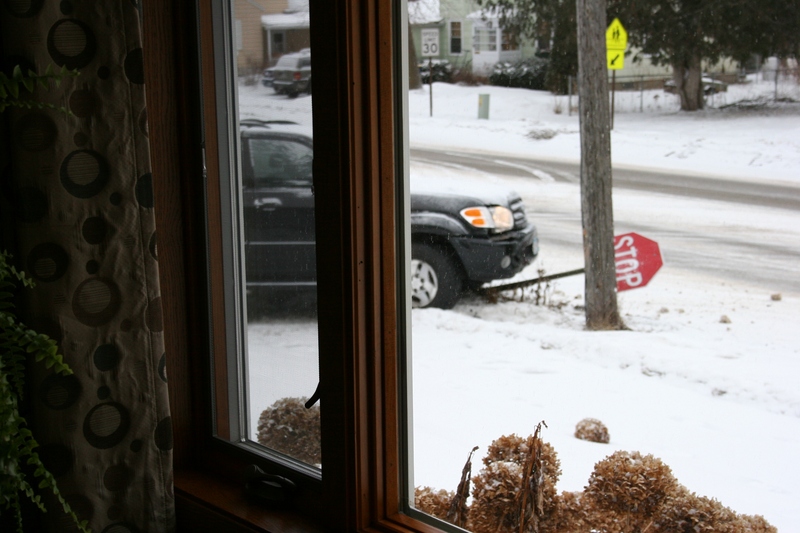 I grab my camera, always at hand, dash to the living room and focus on a vehicle that has taken out the stop sign. No need for me to rush outside as several motorists stop. I don’t know the circumstances of the crash. But the side street past my corner house feeds into an arterial road. The driver may have curved toward the stop sign and power pole to avoid crashing into traffic during the 8 AM rush hour. And, yes, there are morning, after school and after work rush hours. Streets are slicked with a layer of fresh snow. Only 10 minutes or so prior, a City of Faribault truck sprayed sand onto the roadway. Even so, these things happen, especially when driving downhill. The driver documents the crash scene with his cell phone. Damage to the vehicle’s front appeared substantial from my sideways glimpse through the window. 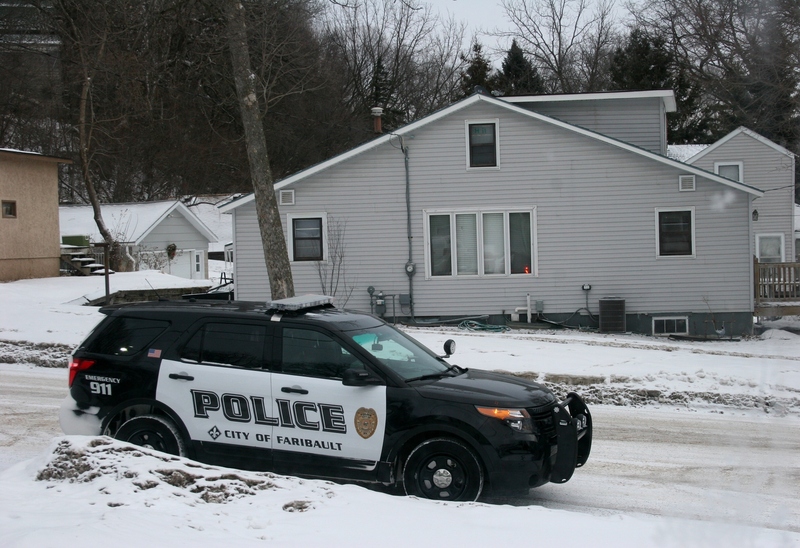 A Faribault police officer arrives within minutes. Be careful out there, both on sidewalks and roadways. 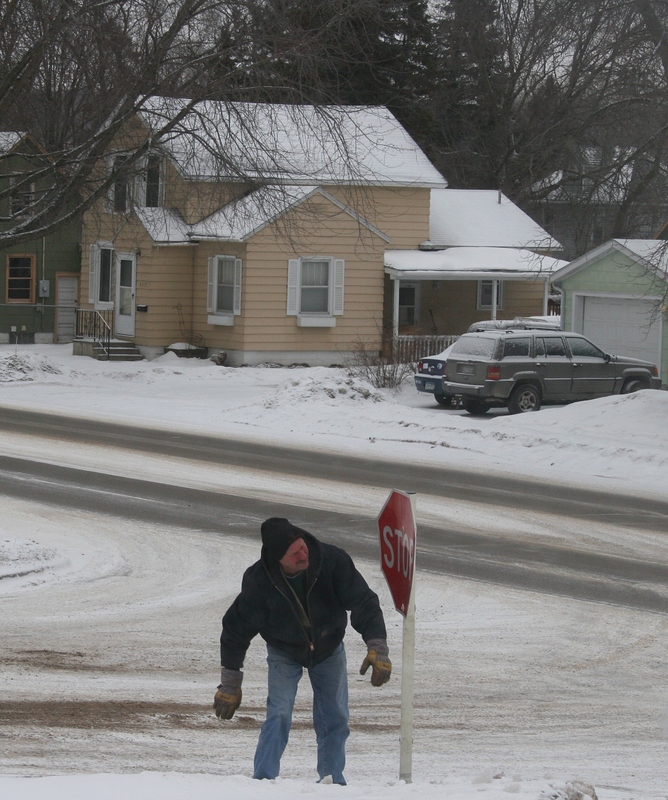 A City of Faribault worker removes the downed stop sign and replaces it with a temporary one. 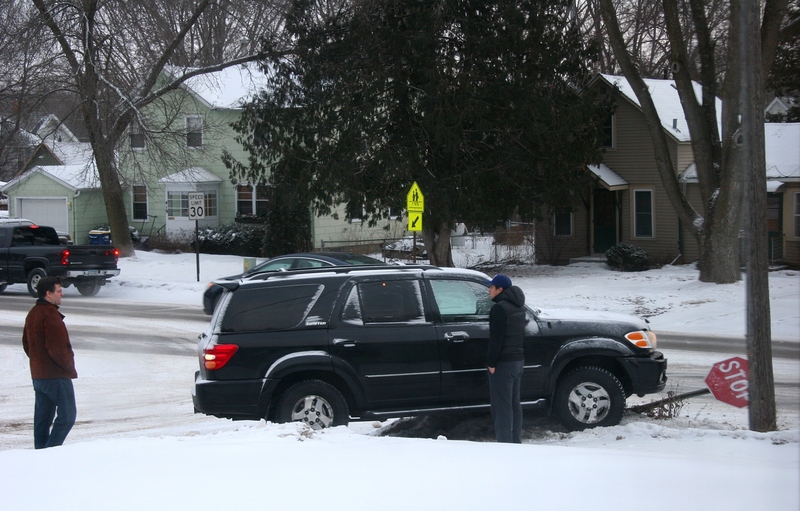 Allow extra time to stop, especially at icy downhill intersections. This week, the beginning of Lent and Christ’s journey toward crucifixion, seems an appropriate time to feature a portrait of a pastor. I met the Rev. Gordon Deuel several summers ago when he was still shepherding Little Prairie United Methodist Church, rural Dundas. 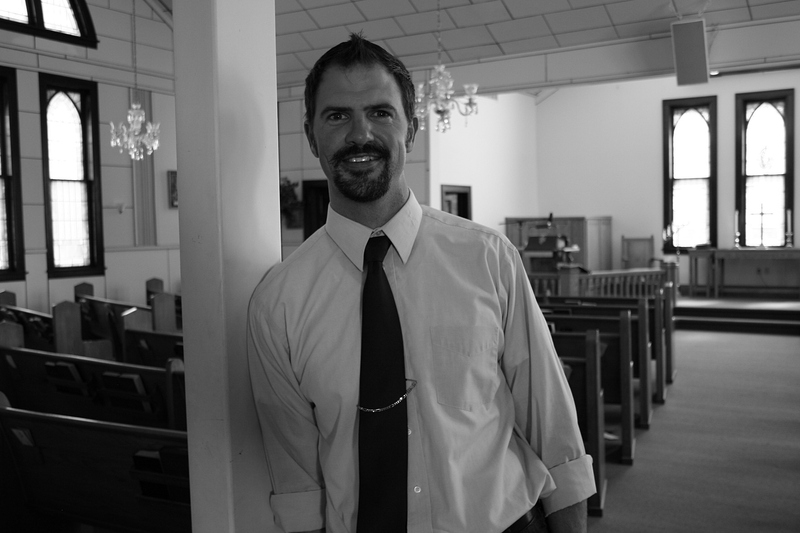 He left in June 2013 to become the Elko New Market Campus Pastor for Lakeville-based Crossroads Church. My introduction to this clergyman happened on a Sunday afternoon when my husband and I stopped at Little Prairie School, a former country school located kitty corner from the Little Prairie church. Pastor Gordon noticed us lingering, walked across the road and unlocked the door into the historic building. Later, we strolled over to the church and poked around. That’s when I captured this portrait of the preacher in beautiful natural light. While talking to Rev. Gordon, I learned that he, like me, is a native of southwestern Minnesota. He’s from Hendricks, which is about as close to South Dakota as you can get without being in it. I always feel a special kinship with prairie people. We are rooted deep in the land, appreciative of wide open spaces and big skies, fields and small towns. We don’t dismiss the prairie as the middle of nowhere, as some place to pass through en route to somewhere better. The prairie is home, whether we still live there or not. With that commonality of place, I connected with Pastor Gordon that Sunday afternoon in August 2012. The residents of Hendricks have focused on creating a town which is a perfect place for children. Our school district is one of the best in the nation. Our weather is temperate and provides for four seasons of fun. We are well grounded in our past, as we continue to worship in a prairie church which is now on the National Register of Historic Places. We look to better our tomorrow through efforts such as our wind farm and organic farming. We believe you will find the Hendricks, Minnesota, quality of life second to none. This is part of a series, Minnesota Faces, published every Friday on Minnesota Prairie Roots. Lake Wobegon quote is from Minnesota writer Garrison Keillor.